MOSCOW, August 5 (RIA Novosti) – The Russian Orthodox Church announced Tuesday it has established an all-Russian headquarters to aid Ukrainians fleeing fighting in the country. 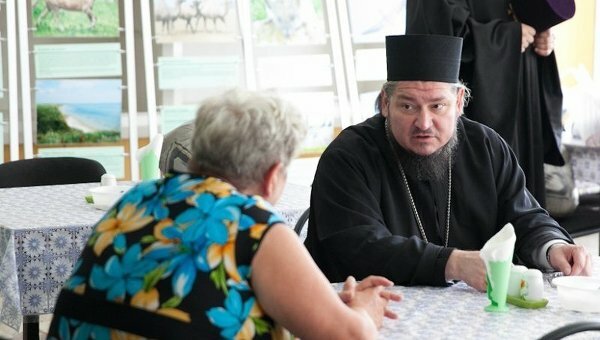 “Blessed by His Holiness Patriarch Kirill, the headquarters’ work will focus on providing targeted aid to the most vulnerable categories of refugees: large families, single mothers, the disabled, and critically ill and elderly people,” the Synodal Department for Church Charity press service told RIA Novosti. The headquarters is to coordinate Russian Orthodox Church aid to Ukrainian citizens in Russia and help them find jobs. The Russian Orthodox Church has regularly been providing refugees in temporarily accommodation centers and tent camps with humanitarian and psychological aid. By August 4, the Synodal Department for Church Charity had raised almost 50 million rubles ($1.4 million) for the refugees. In mid-April, Kiev launched a military crackdown on independence supporters in eastern Ukraine. According to a UN report in late July, the conflict has claimed the lives of 1,129 civilians, with another 3,442 injured. Russia is currently sheltering over 730,000 people who have left Ukraine since the start of the deadly conflict between government forces and independence supporters, according to the most recent official data.